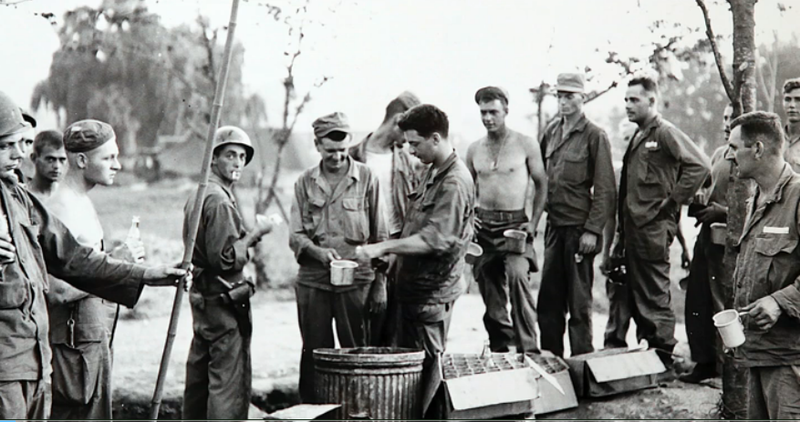 Somewhere in Korea on August 9, 1950, Crawford Flynn served drinks to William Michals – who is wearing a cap and holding an empty tin cup – and other servicemen who gathered during a break in fighting. Long a participant in many veteran wellness and advisory boards, former Air Force Sgt. Betty Perkins-Carpenter was dedicated to to preserving the memory of veterans. Her mission was to track down service members featured in 138 photos taken at the beginning of the Korean War and give copies to them or their families. More than 5.7 million Americans served in the Korean War between 1950 and 1953. Today, there are about 2 million Korean War veterans living in the U.S. with an average age of 80. The historic photos, commissioned by the U.S. Department of Defense in 1950, have been digitally scanned and uploaded to an online gallery Snapshots from the Korean War. By clicking on a photo, visitors can read the caption and complete a form to request a copy of the image. Perkins-Carpenter received the collection of black-and-white, glossy photographs from the Monroe County Chapter of the Korean War Veterans Association about two years ago. She has been reaching out in person and on the phone, calling small-town newspapers and people she found in the phone book whose names matched the names in the detailed captions printed on the back of the photos. Her outreach has netted positive outcomes. Several veterans and relatives have positively identified ten photos. One of the matches include Air Force veteran Crawford Flynn originally from North Carolina. Flynn’s granddaughter Tiana Stephens of Rochester, NY recognized him from a television story. There was something familiar about the man in the center who was pouring drinks. “It was a year after I saw the story on TV that I had the courage to call her,” said Stephens, who brought a photo of her grandfather with her to Perkins-Carpenter’s home to compare images. The photos almost mirrored each other. Moved by Perkins-Carpenter’s mission, Stephens reached out to Kodak Alaris to ask them for help in scanning both sides of the photo collection. The Democrat and Chronicle, a Gannett newspaper in Rochester, N.Y. volunteered to host the photos on a special online gallery Snapshots from the Korean War. To view the photos and to inquire about a photo, visit koreanwar.democratandchronicle.com. In support of former Air Force Sgt. Betty Perkins-Carpenter’s time-sensitive mission, Kodak Alaris digitally scanned 138 photos and captions printed on the back. The Democrat and Chronicle, a Gannett newspaper in Rochester, N.Y. became a partner in the project, creating an online gallery Snapshots from the Korean War. For more information or to make a connection with a photo, call Perkins-Carpenter at 585.586.7548 or email her at bpc [at] senior-fitness [dot] com.